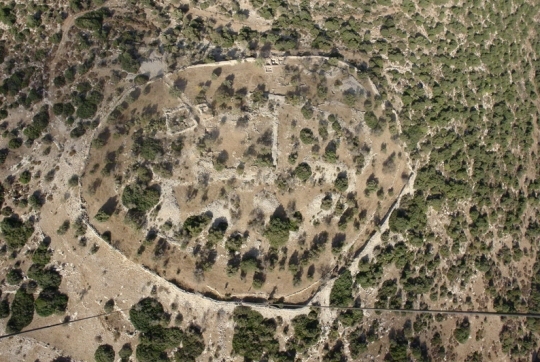 An aerial view of Khirbat Qeiyafa, which is most likely the Biblical city of Shaaraim. Like many of today’s scholarly ideas, Finkelstein’s view is completely at odds with the scientific evidence, but that rarely stands in the way of a popular ideas, especially among those who study the Bible! More than three years ago, I wrote about excavations taking place at a city called Khirbat Qeiyafa. The city has been dated to the 11th-century BC, and in that article, I discuss the fact that it contains a palace that the archaeologists think might have belonged to King David. Whether or not the palace belonged to David, the remains of the city clearly indicate a sophisticated kingdom like the Old Testament describes, and the archaeological evidence found in the excavation indicates that it was most certainly an Israelite city. New archaeological evidence from that excavation goes further in debunking views like those of Finkelstein and adds even more evidence for the historical veracity of the Old Testament. Interestingly enough, this new evidence was first discovered by an amateur! The amateur’s name is Joseph Baruch Silver, and he has provided some of the financing used in the excavation. Even though he isn’t a trained archaeologist, he is obviously interested, since he has provided money for and examined the excavation himself. While he was studying a part of the southern wall of the city, he noticed an irregularity in the pattern of the rocks in one section. As he looked more carefully, he became convinced that he was looking at a gate that had been filled in with rocks some time after the wall had been built. The first reaction of the archaeologists who are in charge of the excavation (Dr. Yosef Garfinkel and Dr. Saar Ganor) was that Silver had made a mistake. After all, they had already excavated a gate in the western wall of the city, and no excavated city in that region of the world from that time period had more than one gate. Besides, they were professionals and had already examined the southern wall. Surely they would have seen a filled-in gate, if there was one. However, when they actually studied that section of the southern wall again, it became clear that Silver was correct! It was, indeed, a gate that had later been closed by filling it with stones. This was a particularly exciting discovery, because there is a city mentioned in the Old Testament three different times (Joshua 15:36, 1 Samuel 17:52, and 1 Chronicles 4:31). It is called “Shaaraim,” and in Hebrew, that means “two gates.” This excavation is in a location consistent with how Shaaraim is mentioned in the Old Testament, and it has been dated to the corresponding time period. In addition, since the excavation is the only one from that time period with two gates, this gives strong supporting archaeological evidence for those passages in the Old Testament. Most likely, then, the excavation known as Khirbat Qeiyafa is an excavation of the Biblical city of Shaaraim! Another really interesting thing about this discovery is that it demonstrates the arrogance that exists in some scholarly journals. The original article that was submitted for publication was rejected, because the amateur is listed as a co-author on the paper. His place as a co-author is only fitting, since he was the one who made the original discovery. However, the journal (Biblical Archaeology Review) does not allow amateurs as authors on papers, for fear that those who financially support an excavation will be listed as authors simply because of the money they have donated. While there is probably some justification for such a policy, it presupposes that an amateur simply can’t make a discovery that is worthy of publication, and that kind of arrogance has no place in science. I will never forget how an amateur (a high school student) was able to lead me to a chemical discovery that I would never have made on my own! If scientists ignore amateurs, they are potentially ignoring some great discoveries! Would you have a suggestion of an archaeology publication? I had heard that BAR was a reliable source for OT archaeology study. I still think it is a reliable source. I just think it has a misguided policy when it comes to amateurs. Very awesome. Brings to mind Heinrich Schliemann and his search for Troy. I think God, to keep scientists, professionals, and people of stature humble, has rewarded passionate lay persons and amateurs with great finds like these throughout history. Thank you for another great article – love your well rounded approach to scriptural literalism.